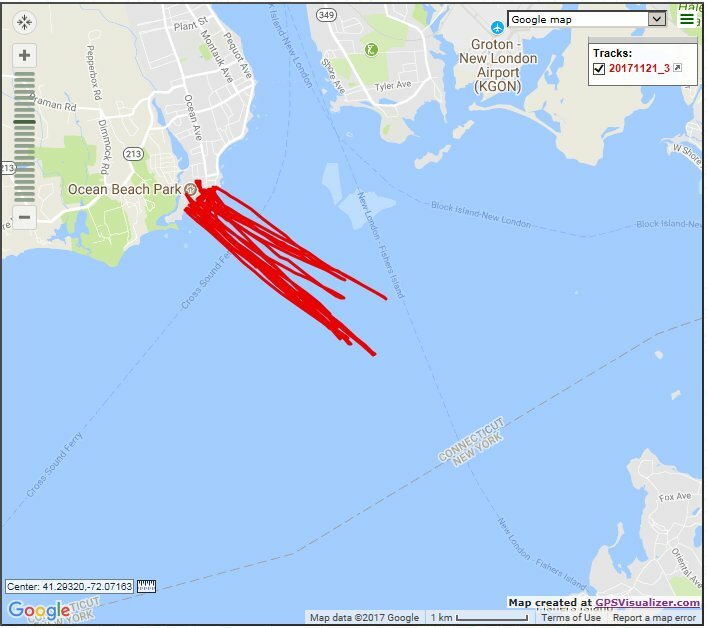 Planning on sailing at Ocean Beach, New London this afternoon. I'll be at Barn, sail up to Napatree, high water noonish. Sorry I did not go to Barn. Winds looked stronger at Ocean Beach and is a shorter drive. Conditions were great and was on the 5.0 overpowered at times. Nice ramps heading out. Sailed solo for about 3 hours. Quit at around 3:30 and looks as though the wind dropped off soon after that. The Sound can be pretty lumpy. Turned out to be too South/Onshore to get to Napatree, but Bart was making speed runs behind Sandy Point. That slalom gear sure can go up wind! I sailed 5.5 overpowered the whole time (long way to the island upwind). Lars, I liked Ocean beach for a ssw wind that one time I sailed it. We had good wind at Pt Judith, I went out at 10am during a 30 minute lull, but soon after it was full on. 4.2 sails for us 175lb sailors. I think that was the day that I enticed you to come to Ocean Beach. Was thinking of Matunuck yesterday, but given the shorter day decided to sail in New London. There was some good rideable waves just upwind from the beach and then some flat water downwind of the rocks near the beach. Yes, the day we sailed I found good waves near the launch. That day was 50mph crazy sesh and then 20mph relaxer. I remember finding good wave spots late when I was chillin on the 5.3. Ocean Beach is 45 mins from my house so I should sail it more often.